Given how needy I am during labor and in the first weeks postpartum (not to mention how having his babies has made me fall more deeply in love with my husband), I can't imagine not having my husband present for the birth of our children. Yet it's a reality military families have always faced. This Veterans Day, those families and the magnitude of their sacrifices are on my mind: families like my friend Lisa's, whose Marine husband missed the births of *both* their babies...and families like my grandparents. My mom's parents, high school sweethearts, got married in September of 1941--hardly able to fathom how their lives would change less than three months later when Pearl Harbor was bombed. 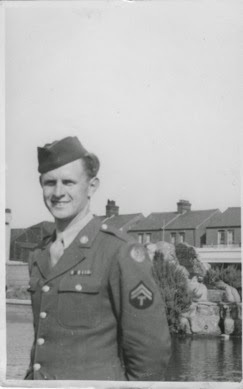 My grandfather joined the Army in early 1943, and he was in basic training when his first child (my beloved aunt) was born in May 1943. The Red Cross notified him by telegram--failing to mention whether it was a boy or girl. He was allowed to come home for a brief visit when his daughter was about six weeks old before deploying to England that summer. He wouldn't see his wife and daughter again until my aunt was two years old. I never got to meet my grandpa; he died just two months before I was born. And the more time passes since my grandmother's death in 2012, the more I wish I'd asked her more questions, listened to more stories, preserved more memories. I have just a couple of letters and cards she and my grandpa sent to each other while he was overseas: a letter she wrote on their third wedding anniversary; a Valentine and a Christmas card he sent. They are precious beyond words; I remove them gingerly from yellowed and torn envelopes, greedily wishing there were more. One is a "Wish for the New Year" card he sent her in December 1944. He signed it, "With all My Love and may we be together to celebrate the next one." I'm grateful that his wish came true. 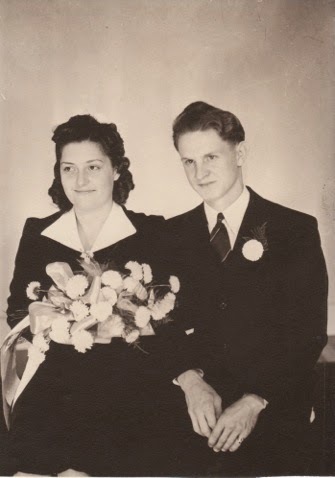 My grandma was one of the lucky ones; her husband came home from the war (making my own existence possible, when my mom was born nine years later). Still, I can't imagine what she went through as a young, new mother, with her husband fighting half a world away--especially before the days of Skype and emails or even easy access to make international phone calls! Over the last few years, especially with living relatively close to an Army base (Fort Campbell), I've developed friendships with a couple of military wives/former soldiers, and I'm frequently in awe of how they do what they do. Most of them downplay it as no big deal, but I don't ever want to take it for granted: because they give up their husbands, mine gets to stay home. Because they sacrifice to serve our country, my little boys can be free to wave flags at a Veterans Day parade totally oblivious to what it is like to have war in your country, or even to have your life touched by war in any way. So this Veterans Day post is my feeble attempt to honor the memory of Ed and June Wise, members of "The Greatest Generation," and to say to veterans and their families everywhere, with the most inadequate but sincere words I have: Thank you. It's important to remember these family stories isn't it? Josh's grandfather also served in WWII as did my grandfather. Thankfully both returned home and neither saw much action. My mom has my grandparents "airmail" exchanges. Unfortunately their marriage was not happy. But like yours, their early years were spent apart and I think my aunt was around 2 years old when she met my grandfather for the first time too.